Marine occupations are plagued by some of the highest accident and mortality rates of any occupation, due in part to the variety and severity of environmental hazards presented by the ocean environment. In order to better study and communicate the potential impacts of these hazards on occupational health and safety, a semi-objective, hazard-focused climatology of a particularly dangerous marine environment (Northwestern Atlantic) has been developed. Specifically, climate has been summarized as the frequency with which responsible government agencies are expected to issue relevant warnings or watches, couching results in language relevant to marine stakeholders. Applying cluster analysis to warning/watch frequencies identified seven distinct ‘hazard climatologies’, ranging from near-Arctic conditions to areas dominated by calm seas and warm waters. 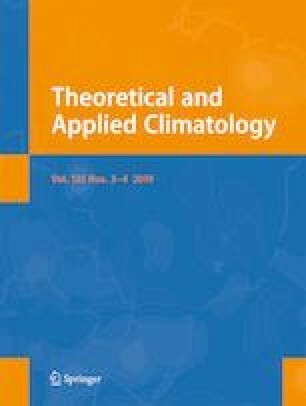 Spatial and temporal variability in these clusters reflects relevant annual cycles, such as the advance/retreat of sea ice and shifts in the Atlantic storm track; the clusters also highlight regions and seasons with comparable operational risks. Our approach is proposed as an effective means to summarize and communicate marine risk with stakeholders, and a potential framework for describing climate change impacts.